"Is none a number?" you might ask. I'm glad you did. The answer is Yes! For example, how many lumps of cheese do you see next to you? The answer, depending on where you are, is likely "none." Counting withthe reader all the way up to ten, the Hueys explain numbers as only they can. The number 4 is the number of tantrums thrown by Kevin every day. 7 is the number of oranges the Hueys have balanced on things. And 9 is the number of seagulls who attacked Frank's French fries. Together they make quite a spectacle. But when you take away all of these fun illustrations in the book? You're left with none! 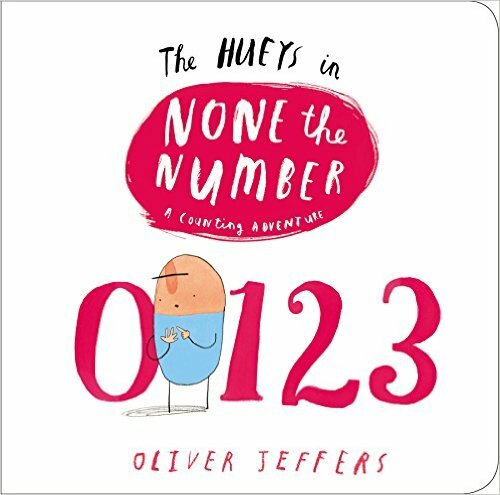 This funny and accessible counting book from #1 New York Times bestseller Oliver Jeffers gives the Hueys one more reason to be every young child's best friends.